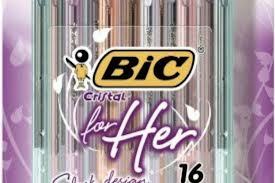 Amidst the current furore about trolls on Twitter I was reminded of the reaction when Bic recently released a range of pens ‘for her’. 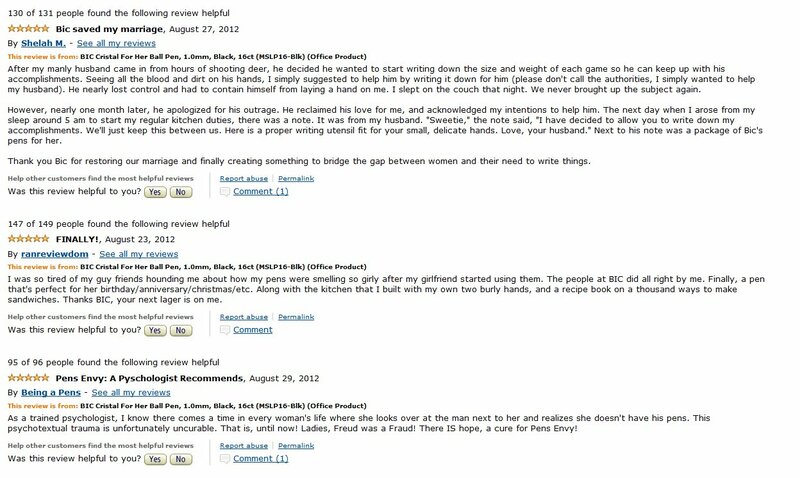 To date on Amazon there have been over 600 reviews of the product, and they almost uniformly make great reading. The comments are a fabulous example of how to make a point with wit and panache, rather than by hurling abuse. I would be advocating that this is the sort of approach everyone should be taking; but I realise that trolls aren’t about making a point, they are simply trying to get a reaction in the way that bullies have always done. Nonetheless, if you want an entertaining read as well as a great example of how a bit, or a lot, of irony and sarcasm can be used to great effect then take a look. The pens themselves, though, what an awful idea. Made even worse by the BIC commercial for them. Really what’s next, keyboards for girls?